After months of speculation, it was finally confirmed by HBO today that Game of Thrones Season 8 will debut in 2019, although a premiere date for the final season has not yet been given. We first heard about a potential Game of Thrones Season 8 2019 debut back in June, when HBO programming president Casey Bloys hinted in an interview that the final season may not air until next year, although he stated that wouldn't be determined in full until a later date. That date has come, with HBO offering a brief statement about the 2019 debut, while also listing the previously-confirmed directors and producers. "Your readers may be interested to know that the hit HBO series Game of Thrones will return for its six-episode, eighth and final season in 2019. Directors for the new season are: David Benioff & D.B. Weiss, David Nutter and Miguel Sapochnik. Writers for the new season are: David Benioff & D.B. Weiss, Bryan Cogman and Dave Hill. Season seven credits: The executive producers of Game of Thrones are David Benioff, D.B. Weiss, Carolyn Strauss, Frank Doelger and Bernadette Caulfield; co-executive producers, Bryan Cogman, Guymon Casady, Vince Gerardis and George R.R. Martin." Production on Game of Thrones Season 8 got under way this fall, with star Liam Cunningham, who plays Davos Seaworth, revealing in an October interview that Game of Thrones Season 8 production will last until the summer of 2018. Ironically, this season has the fewest amount of episodes of any other season, with just six episodes, but there have long been rumors that each of these six episodes will be feature-length, which would account for the extra production time. While this final season will give fans the fewest episodes, it will be the longest season to shoot out of all eight seasons. 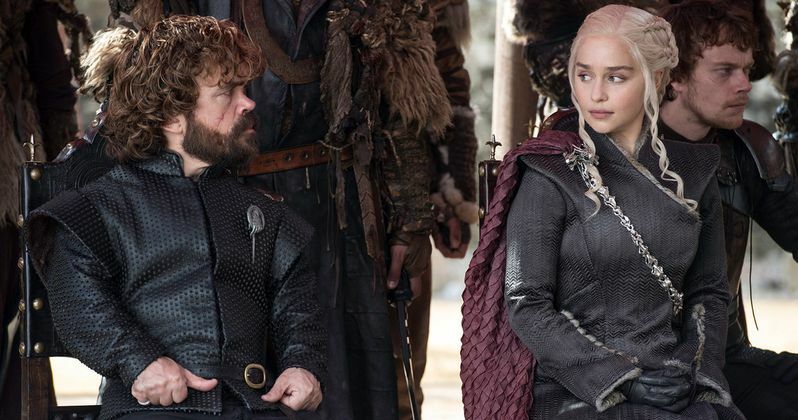 Another report from September revealed that Game of Thrones Season 8 is the most expensive yet, with HBO reportedly shelling out a massive $15 million per episode for the six-episode season. The show has grown by leaps and bounds, with the first season reportedly costing $6 million per episode for the 10-episode season. The fantasy series is the only show on television that shoots three units at the same time, filming in locations all over the world, on four separate continents, with the show's production hub in Belfast, Ireland. There has still been no official confirmation that each Game of Thrones Season 8 episode will be a feature-length episode, but it seems likely. While HBO hasn't released a full cast list for the season yet, a report from October revealed that Marc Rissmann, best known for his work on AMC's Into the Badlands, has been cast as a mercenary named Harry Strickland from the George R.R. Martin novels. In the novels, Strickland is the leader of a mercenary group known as The Golden Company, which was mentioned in the Season 7 finale, when Euron Greyjoy (Pilou Asbaek) was tasked with bringing The Golden Company to King's Landing to fight for the Crown. These mercenaries, who will fight for anyone if the price is right, have been mentioned before, during a Season 3 episode where Davos Seaworth tries to persuade Stannis Baratheon (Stephen Dillane) to enlist The Golden Company's services. Hopefully we'll have more on Game of Thrones Season 8 from HBO in the near future.